Most people live in a society with a religion that has a moralizing god. You know, the one(s) that hand out rules from on high. “Thou shalt do this, don’t do that, do star jumps at the weekend”1. However, moralizing gods are quite unusual. In fact, it seems they only became common within the last 10,000 years or so; likely evolving with the advent of farming and bigger societies1. So what was religion like before that? Hunter-gatherers may hold the answer. When we study them, we see a much greater variety of religious beliefs, from shamanism to spirit animals. Can we use this wealth of data to try and reconstruct the first religions2? Hervey Peoples and colleagues decided to tackle this issue. They’d previously done research into the origin of those moralizing gods1. So finding what came first is the obvious next step2. Their approach was to use simple evolutionary logic. When we look at how lineage evolved, the frequency of traits gives a clue to the order of their evolution. Features that evolved earlier in a family would be inherited by all later species, becoming more frequent than later traits. So, Peoples et al. took this parsimony approach and applied it to hunter-gatherer religions. They looked at 33 of the most well-studied hunter-gatherer groups and began classifying their religious characteristics2. Would the frequency of these features tell us the order they evolved? Animism: the belief that natural things have a soul/spirit/life force. The belief that some of these spirits could survive death in an afterlife. A group had a designated someone – colloquially called a Shaman – responsible for rituals. Ancestor worship, where dead kin was believed to live on somewhere they could continue to influence daily life. Those moralizing gods from the beginning. These weren’t mutually exclusive, with many of these features co-existing. Shamans, for instance, might converse with animistic spirits to try and influence the natural world2. When all of this is taken into account, the frequency of different beliefs in hunter-gatherers looks a little something like this. As you can see, there does seem to be a clear order to these beliefs. We find a common foundation of animism, suggesting that came about first. Other traits appear layered atop this. So, it looks like the first human religions were based on the idea of natural spirits. That everything had an essence beyond the physical world you can see2. Then came shamans that communicated with these spirits, and a belief they could live on after physical death. These are more common outside of Africa, suggesting this emerged in groups migrating out of the continent. It’s almost universal in American groups, suggesting their common ancestor had it. This implies these beliefs emerged between leaving Africa and arriving in America2. High gods and ancestor worship occur a bit more randomly, geographically speaking, making their evolution harder to track2. All of this is fascinating. However, what I found most interesting about all this is the idea that these beliefs might be even older than that. See, Peoples et al. ran some statistics to figure out when these beliefs came about in the hunter-gatherer family tree. At each division in the tree, it gave the odds the belief had evolved by then. 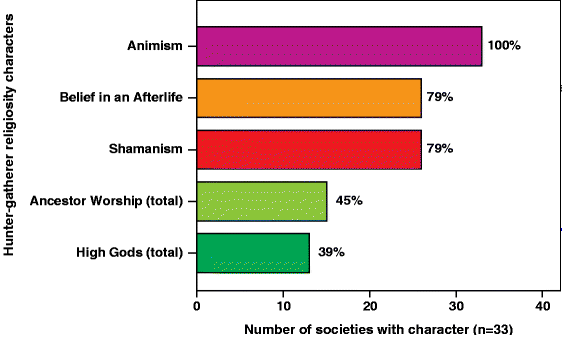 Here are the ones for shamanism and a belief in the afterlife2. As you can see, even the earliest nodes have a roughly 50/50 split. In other words, there’s a significant chance these beliefs had evolved before this family tree starts. Which is around 90,000 years ago2. A post-90 kya chronology – which I stuck bold earlier – is more likely. But there’s not a small chance religion might be even older. Perhaps we were religious before we met the Neanderthals. Before we even left Africa. Maybe, before we were even properly humans. Peoples, H.C., Duda, P. and Marlowe, F.W., 2016. Hunter-gatherers and the origins of religion. Human Nature, 27(3), pp.261-282. Previous post: Did body odor evolve to scare of predators? Next post: Neanderthal cave art is fake news? Wouldn’t surprise me at all that religion should predate our species. When Jane Goodall studied the chimps at the Gombe reserve she recorded them doing “rain dances” and giving excited displays during thunderstorms, for no real reason other than being awed by a spectacle of Nature. That’s easily translatable to being awed by something God-like. Perhaps by the time H.Erectus came on the scene there were already those individuals in the band who were more adept at understanding the unexplainable, or even able to exert some small bit of control over it—this is the time when hominins were supposed to have gained control of fire, or some measure of control. The guy who carried the coals in a wet clay pot might be the first shaman, or witch doctor. And that reminds me…aren’t witch doctors from Africa analogous to shamans from anywhere else? The story of the rain dances reminds me of a similar practice of chimps throwing a rock at a tree for no discernable reason other than making a loud noise. The practice seemed to have been going on a long time and carried out by multiple chimps, given the size of the rock pile at the base of the tree.